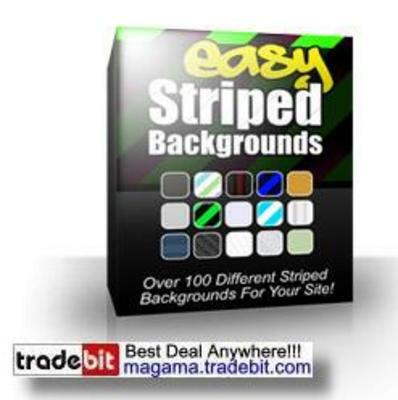 "How To Easily Add Web 2.0 Style Striped Backgrounds To Your Sites...."
Ever wanted to add those cool Web 2.0 style striped backgrounds to your websites? Don't know how to do it, or maybe you'd just don't want to waste your time trying to figure it out? Well, I've done the legwork for you, and compiled a package of over 100 most popular striped backgrounds that you can easily add to your sites and all other graphics. Want to see how they look? There's plenty of variety in this package. I tried to create all of the most popular styles. So you're pretty much set with this package as far as striped backgrounds go. Over 100 different background images in PNG format. These are ready to be added to your website's background. Just save the PNG image as your background, and you're ready to go. No special software required. A .pat file for Photoshop containing all of these patterns. So you can easily add these patterns to ANY image you want, using Photoshop or Photoshop Elements. Add these stripes to your headers, footers, covers, buttons, etc..
Master Resale Rights to this same product so that you can sell it yourself and keep 100 of the money. This is a really handy tool, so why not share it with others and make some money while you're at it. So how much is all this? Be Your Own Doctor PLR!